Contemporary Handcrafted Fused Glass. Member of Contemporary Glass Society and the Crafts Council of Ireland. Connemara Blue was founded in 2010 by established glass artist Ben Crow. With a strong focus on unique, contemporary design, and inspired by his love of the Connemara landscape, Ben has created one-of-a-kind art pieces which are valued by collectors worldwide. Between 2012 and 2016 Ben trained and took on two artists to join his team, Wendy Debrock-Jeffries and Claire Lee. 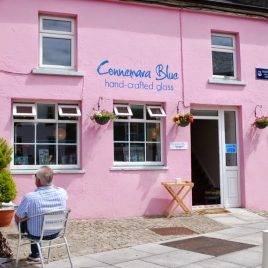 As well as our own unique pieces, Connemara Blue also offer a bespoke design service, and fused glass workshops for all ages.